Reservations not available unless booking a Picnic Party. Our 5 acre grove has plenty of seating along with a shaded patio in front of the restaurant. The Farm Kitchen is the original restaurant at The Farm property. With their walk-up counter, you can choose from an assortment of delicious sandwiches, fresh soups, seasonal salads and made-from-scratch baked goods. 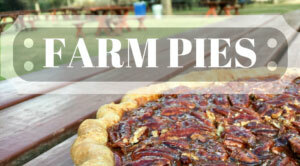 Pick your items to put in your picnic basket and explore our Pecan Grove to find the perfect spot to sit at our picnic tables and relax under the shady pecan trees. Enjoy the scenery alone or bring a group to celebrate an occasion. Don’t forget to ask about a variety of lawn games available at The Farm Kitchen pick-up window for customers to enjoy! Kid and dog friendly! Picnic Parties – Perfect for Baby Showers, Birthday Parties, Wedding Showers, Wedding Rehearsal Lunch, as well as social and family gatherings. House made pies available to reserve at Farm Kitchen! Please reserve at least one week prior to pick up. Farm Kitchen is the perfect spot for your picnic party. We do all the work allowing you to be part of the fun. Your guests will love the rural tranquil setting while enjoying delicious casual food. Call or email for more information.